Everything you want to know about the history of architecture is included in this comprehensive guided tour. Author Carol Strickland brings us architectural wonders of design from the Stone Age to the Space Age - including Stonehenge, the Eiffel Tower and more. 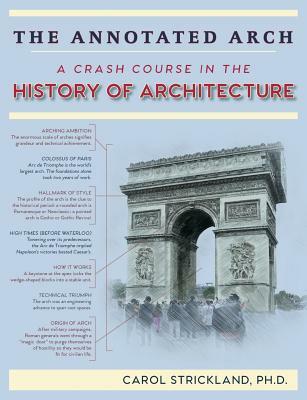 With 192 illustrated pages peppered with informative sidebars and biographical anecdotes from Brunelleschi to Frank Lloyd Wright, this fascinating crash course covers everything you need to know - from cultural history to architectural breakthroughs--in a quick-to-review, easy-to-retain format. Covering all bases, The Annotated Arch explores the ancient world, the Middle Ages, 18th and 19th centuries, and 20th century and modernism.